I explained all the background of how it took me two years to finally get myself signed up to do some Context Travel tours in the post I did earlier this week about my first tour, Baguette to Bistro. I spent the morning with the incomparable Meg Zimbeck, the tour docent, as well as founder, editor and contributor to one of my favorite food blogs, Paris by Mouth. The tour was fabulous and after spending a few hours wandering along the Seine, I re-met up with Meg as well as two other tour-takers to take The Bobo Palate tour in the Haute Marais district (upper third arrondissement). The Marais is an area that I have not spent a lot of time in so I was looking forward to exploring a small part. It is an area that is going through a transformation and it is an exciting area to visit. There is the old Jewish quarter mixed with a heavy gay population and newly added bobo (bourgeois-bohème, a.k.a. yuppie) element. Stir gently and this makes for wonderful shops, bistros and food markets! Similar to my post on Baguette to Bistro, I am not going to give every detail of the tour as I want you to take it for yourself! However just like the morning, we started at a boulangerie. It was none other than a Poilâne bakery, one of three in the city. 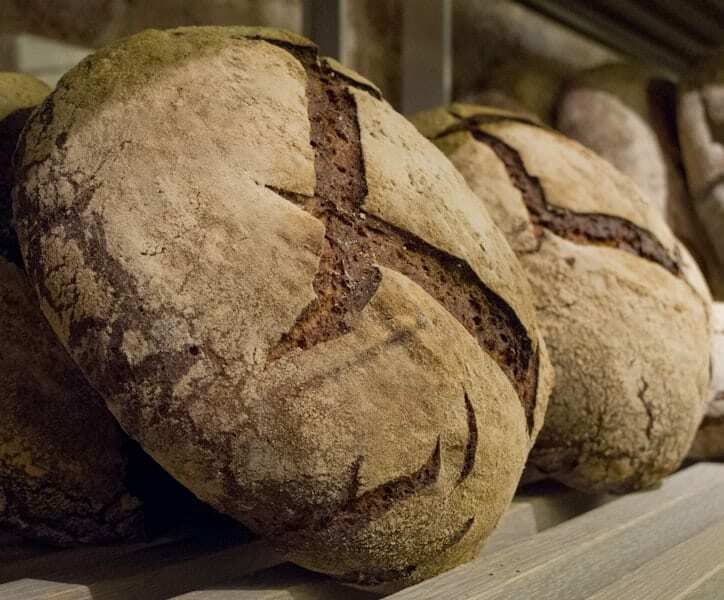 The family and the company has quite a history (here is a great post on them from Ann Mah) and they are most known for their boule (pictured below) which they call a La miche Poilâne (and I know them as a levain here in the U.S.) as well as their Galette des Rois in which they have a fève that is specially commissioned. Meg spoke about the bread and I inhaled the amazing smells and took photos of some of their offerings. I was thinking that I wanted one of their escargots for breakfast when Meg shuffled us out the door to our next stop. Our next stop was Jouannault père & fille, a local cheese store (fromagerie). Unlike the Androuet store that I visited in the morning, it was a working man’s store, not fancy, but with products that were equally impressive in their range of selection and freshness. Meg took some time to give details of the shop, the owners, the types of cheese we could find there. The two ladies that I was taking the tour with were staying in an apartment so they bought some supplies for their kitchen, a bonus since they were with such a knowledgeable docent! 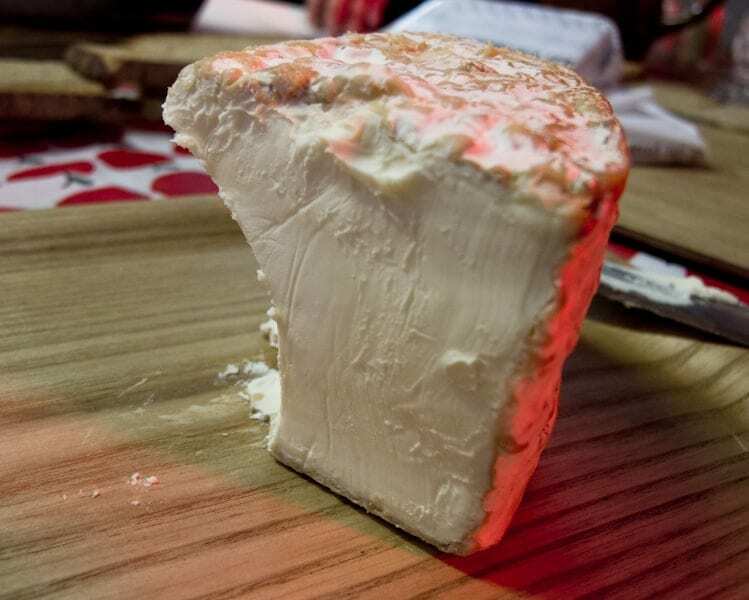 We took our Poilâne bread and a selection of cheeses that Meg purchased and headed next door to the Marché des Enfants Rouges, the oldest covered market in Paris (see a great post on it from Haven in Paris) where we ordered a pichet of wine and commandeered a table to taste our bounty. I am going to share a little more about this part of the tour and what I sampled as the choice of cheeses is different for each tour depending on what is good that day and what is in season. These are the ones I sampled. Next came a bleu d’Auvergne, a cow’s milk cheese that is fairly strong with a slightly spicy taste and a hint of grass which we tasted with pâte de coings (quince fruit). While I love blue cheese I don’t normally like bleu d’Auvergne, but tasting it as fresh as we got it from the shop, I really like it. I think the ones that I get locally in the San Francisco Bay Area are a lot older and don’t taste the same. 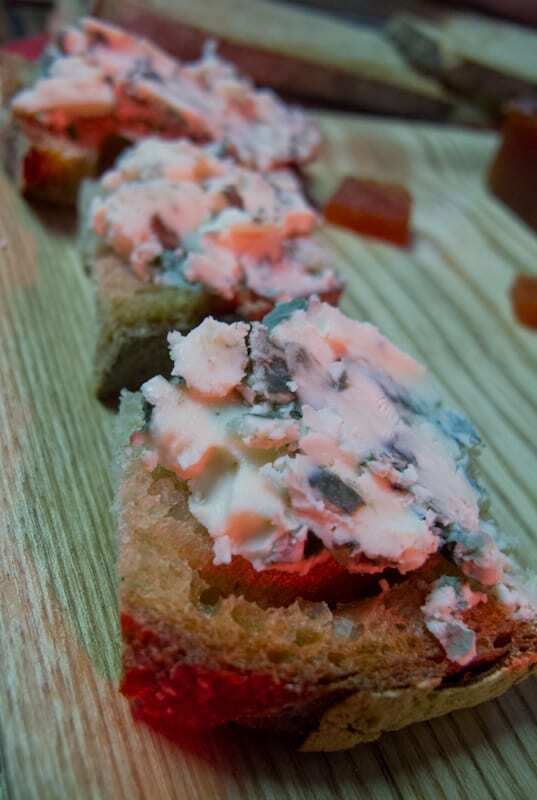 We moved onto to Roquefort, my personal favorite. I knew it was going to taste divine on top of that slice of bread and I was not disappointed! I am so happy that I can get this cheese all the time where I live! 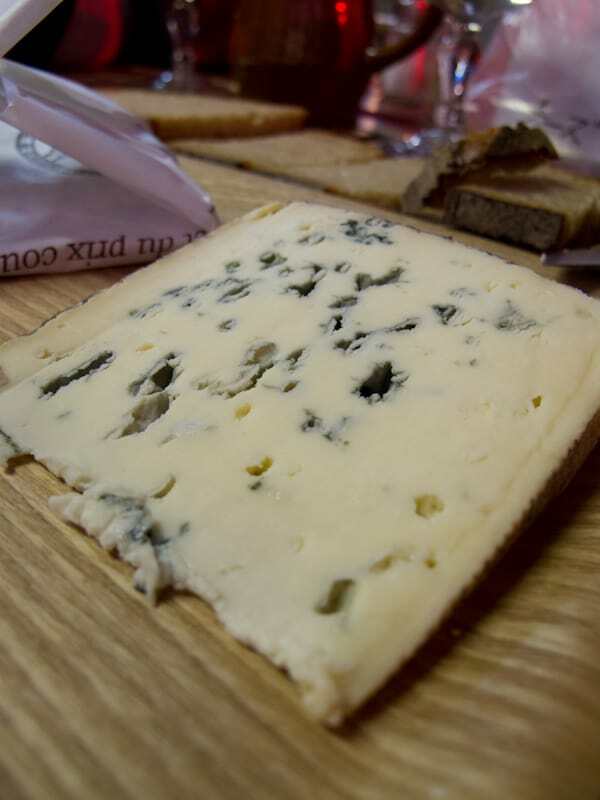 For those of you unfamiliar with Roquefort, it is a little pungent with a sharp flavor, made from a special breed of sheep and then ripened in limestone caves where a unique mold grows. It is quite delightful and I love it with red wine, walnuts and slices of apple. 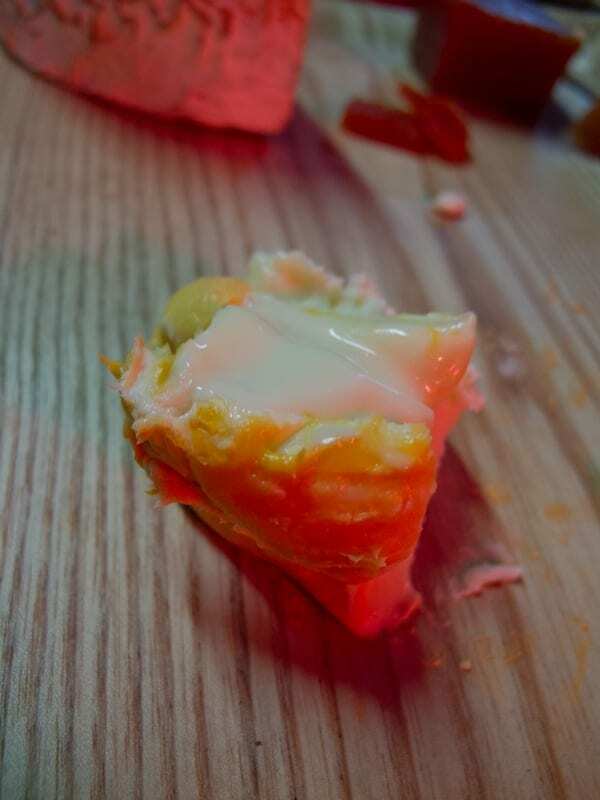 We ended with a Langres, a cow’s milk cheese from the Champagne region. It is washed cheese, meaning the rind is finished with something, usually alcohol (and this one is finished with champagne!). It has a dense texture with a creamy flavor that tastes a little bit like sour milk (not a bad thing!). Fully saturated with cheese and to-die-for bread, we headed out of the market to check out a spice shop that was on the way to dessert…chocolate! We stopped at Thiercelin which is a cook and foodie’s dream. We visited the three levels of food, spices, cookbooks and kitchen supplies. They have an exceptional amount of choice and the prices are really good. The one thing they weren’t was camera friendly. I did snap a photo or two, but when the shoppe-keeper offered us a sample of their rather unique calisson, he didn’t allow me to photograph it (tant pis). 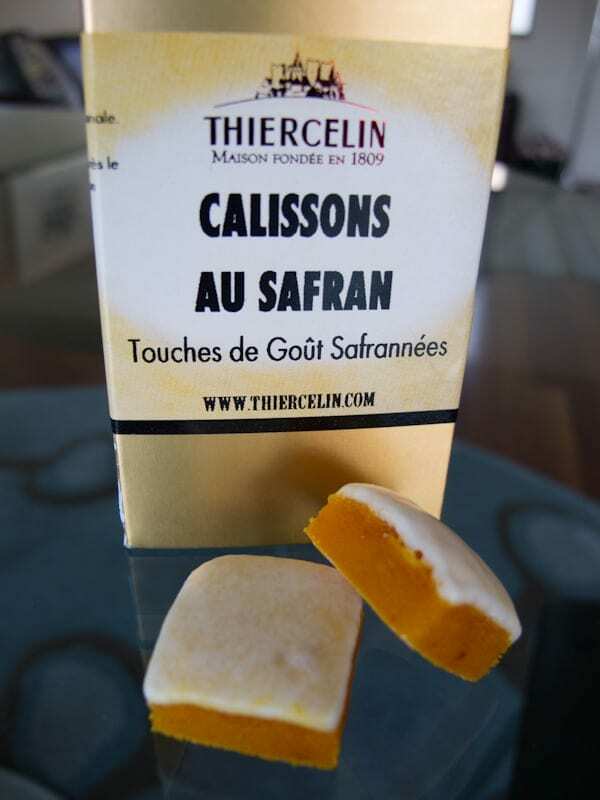 This is a candy from the south of France, something I generally don’t like, but this one was made with saffron and it very tasty. So tasty I bought a box and brought them home, and then did my own little photo shoot so that you can see what they look like. He was not rude about it and very graciously showed us around. The evening was getting late and despite the fact that Meg still had a chocolate shop stop planned, I had Mr. Misadventures waiting for me back at the hotel, and since he was the reason I was doing this weekend in Paris, I didn’t want to make him wait too long for dinner! I thanked Meg for another wonderful tour and wished the two ladies a wonderful stay in Paris. I then headed out the door and into the night. The Bobo Palate is another amazing Context Travel tour and I am so pleased to share my experiences with you because I would HIGHLY recommend this activity for you on your next trip to Paris (or if you live there, do it, you will discover areas of Paris that you aren’t familiar with, promise!). If you can get Meg Zimbeck as your docent, all the better (although ALL their docents rock!). For more info on Context Travel tours in Paris, visit their website. Not only that, but as I mentioned in my Baguette to Bistro tour, Paris is not the only location that this amazing company operates tours in. I say amazing as Context Travel is a company that practices and deeply believes in sustainability, they have even created the Context Travel Foundation for Sustainable Travel and operate as a certified B Corporation a relatively new kind of company which uses the power of business to solve social and environmental problems. See more photos of the tour in my Paris Jan 2012 set on Flickr. I just discovered your blog last week and I couldn’t be happier! I’m spending the summer in Europe, mostly in Arcachon, France. Your blog has made me even more excited about the trip. Especially this post. I can almost taste the wine and cheese already! @Emily, bienvenue! Oh goodness, you are in an area that I have yet to visit, but am dying to get to! There is amazing food everywhere in France and the seafood where you are going to be should be yummy! Looking forward to checking out your adventures, and thanks for stopping by (come back, come back!)! Oh my that cheese looks divine! I have always dreamed of visiting Paris and this post makes it look even more enticing!